​If you have IBS, certain carbohydrates known as FODMAPs could be triggering your symptoms. When food is chewed and swallowed, it moves into the stomach, travels to the small intestine, and then moves on to the large intestine. During its journey, enzymes in the intestines break down the food so it can be digested. ​Unlike many other carbohydrates, FODMAPs are difficult to digest and aren't as quickly broken down. This means they stay in the digestive tract longer, pulling too much or too little water into the intestines or getting fermented by the gut's natural bacteria. For many people with IBS, this process can trigger symptoms, such as gas, bloating, cramping, constipation, and/or diarrhea. That's why following a low-FODMAP eating plan often helps people with IBS feel better. FODMAPs are a broad variety of naturally occurring carbohydrates found in many plant-based foods. They can wreak havoc on sensitive digestive systems, especially in people who have irritable bowel syndrome and other chronic functional bowel disorders. 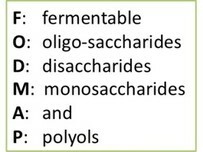 ﻿The word “FODMAP” is an acronym that stands for fermentable oligosaccharides (fructans and galacto-oligosaccharides, also known as GOS), disaccharides (lactose), monosaccharides (fructose), and polyols (polydextrose, isomalt, maltitol, mannitol, sorbitol, and xylitol). Pinpointing and eliminating FODMAPs while maintaining nutritional excellence can be especially challenging for vegans, because FODMAPs are found in an extensive range of the most common and popular vegan foods and ingredients. ​Not all carbohydrates are FODMAPs. FODMAPs are present in many different foods and in many different food groups. If two or more low-FODMAP foods are combined into one serving, it may lead to a high-FODMAP serving. For many people, one or more types of FODMAPS may cause symptoms while other types may not.